A Ohio mother seeks damages for emotional and financial stress she claims has resulted from raising her mixed-race daughter in an all-white town. A white lesbian couple filed suit Monday against the Midwest Sperm Bank in Downers Grove, Ill., alleging that the company mistakenly provided vials of sperm from an African-American donor rather than the white donor requested, reports the Chicago Tribune. Jennifer Cramblett, a white 36-year-old resident of Uniontown, Ohio, is seeking over $50,000 in damages for "wrongful birth and breach of warranty, citing the emotional and economic losses she has suffered," the Tribune reports. Cramblett's suit says she and her partner, Amanda Zinkon, requested sperm from white donor "No. 380" in 2011. Once Cramblett was five months pregnant, the couple then ordered more sperm from the same donor for Zinkon to use. When they received sperm from African-American donor "No. 330," they realized a mistake had occured. The mix-up was due in part to the fact that Midwest Sperm Bank keeps written rather than computerized records, Cramblett told Cleveland TV station WOIO (watch the video below). 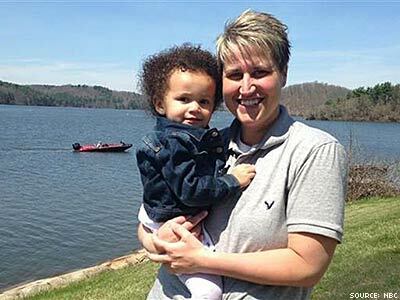 In August 2012, she gave birth to "a beautiful, obviously mixed-race" girl, her lawsuit says. The couple say that raising their daughter, Payton, now 2, is difficult because they live in an all-white community, notes the Tribune. "Jennifer bonded with Payton easily and she and Amanda love her very much," the lawsuit explains. "Even so, Jennifer lives each day with fears, anxieties, and uncertainty about her future and Payton's future." "Because of [her white] background and upbringing, Jennifer acknowledges her limited cultural competency relative to African-Americans and steep learning curve, particularly in small, homogenous Uniontown, which she regards as too racially intolerant," the lawsuit continues. In the suit, Cramblett lists some of the difficulties she faces in raising a mixed-race child, saying she's unwelcome in the "black neighborhood" she visits to have Payton's hair done, fears her intolerant and homophobic parents will not accept her daughter, and that it would be a hardship to relocate to a racially diverse community as therapists have suggested. However, Cramblett told NBC's Today show that the lawsuit is not about racial bias. Rather, she says she only selected a white donor with blue eyes so that her baby would look like her partner. "I don't find any problems with having a mixed-race child as far as I'm concerned," she told Today. "She will understand it wasn't about 'We didn't want you.'" While the Midwest Sperm Bank declined comment on the ongoing litigation, the Tribune reports that six months after Cramblett learned of the mistake, the sperm bank sent her an apologetic letter and a refund for the six vials of sperm she'd received in error.